← southbound . . .
out of Bashō . . . Some of you might know that my husband, Larry Chapman Kelly, passed away suddenly a week before Thanksgiving. Others, who know my work, know that Larry was frequently the inspiration for and subject of my tanka, and will surely continue to be so. During the past year of his life, Larry used a sassafras walking stick he had inherited from his father in order to remain mobile, and the sight of him returning home from work each day made me think of my poetic hero Bashō, who traveled on foot to record his world at the end of his life. 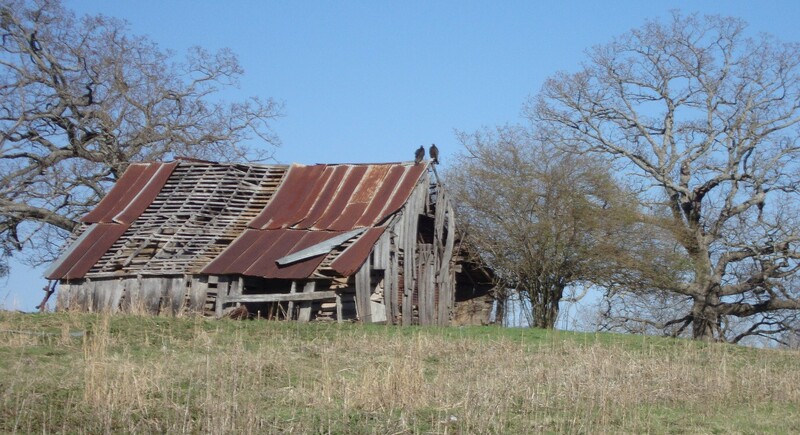 Like Bashō, Larry often documented the world around him–through pictures rather than poems; the barn featured here is one of many he encountered and photographed on his travels. This entry was posted in Family, Larry Chapman Kelly, red lights, Tanka, Winter and tagged Basho, Family, Love, Red Lights, Tanka, Winter. Bookmark the permalink. 24 Responses to leaning on his cane . . .
A beautiful and very moving tribute! Thank you, Jenny . . .
Beautiful words, Maggie. Larry’s photos were really stunning and it’s wonderful that you continue to draw upon them for inspiration. Lovely tribute. I’ve enjoyed tweeting this tribute so that others may appreciate too. Thank you, dear Alan. I appreciate your kind words. A lovely and loving tribute – and am so sorry for your great loss. Thank you, Ada . . .
thanks, Margaret, for sharing all this! I so well know how the deceased beloved will continue to inspire poetry & more poetry!! may peace accompany loving memories!! Thank you, Susan. I’m touched by your generosity and kindness. Such a wonderful tribute, Margaret! Thank you, Belinda . . . I am sorry for your loss. Although gone, his memory and photos will surely continue to be an inspiration for your tanka. Thank you so much, Adelaide. A stunning tanka, photo, and tribute, Maggie. May he forever inspire you. Thank you, Mary . . .